Unlike many other "decks" that might receive primers, Oath is not truly one deck. Rather, it is the foundation upon which several decks are built. The foundation is as follows. Using the one-card-combo that is Oath of Druids, fueled by the token generation of Forbidden Orchard, get a high-value creature into play as early as turn two. The creatures used in Oath have varied dramatically over the years. They generally fit into one of two categories; creatures that help you win a control game and creatures that help you win with a combo. 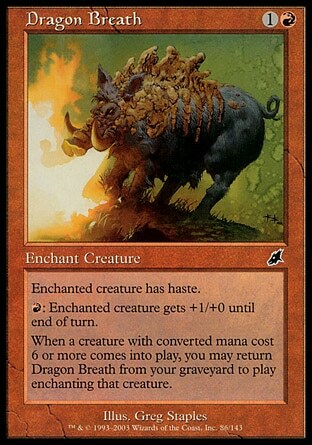 More recently, players have converged on Griselbrand as the creature of choice. His card-drawing ability allows for either role to be played while representing a three-turn clock. Control Oath decks will often play 2-4 Show and Tell, acting as Oath of Druids numbers five through eight. Show and Tell dodges much of the most common Oath hate, including both Grafdigger's Cage and Containment Priest. While its ability is, on paper, symetrical, it is often low-risk in today's format dominated by Workshops and Mentors*. This is especially true when combined with the 2-4 Thoughtseize that the control Oath player will likely be playing. *This is what I get for not finishing writing this before a B&R update. It makes for excellent bait and does not need to be used exclusively as a replacement Oath. 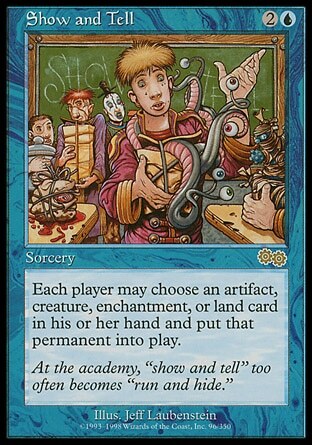 Play Show and Tell first to test whether your opponent has a counter. If they do, that's fine, you'll play Oath next. If they don't, use Show and tell to put Oath into play. 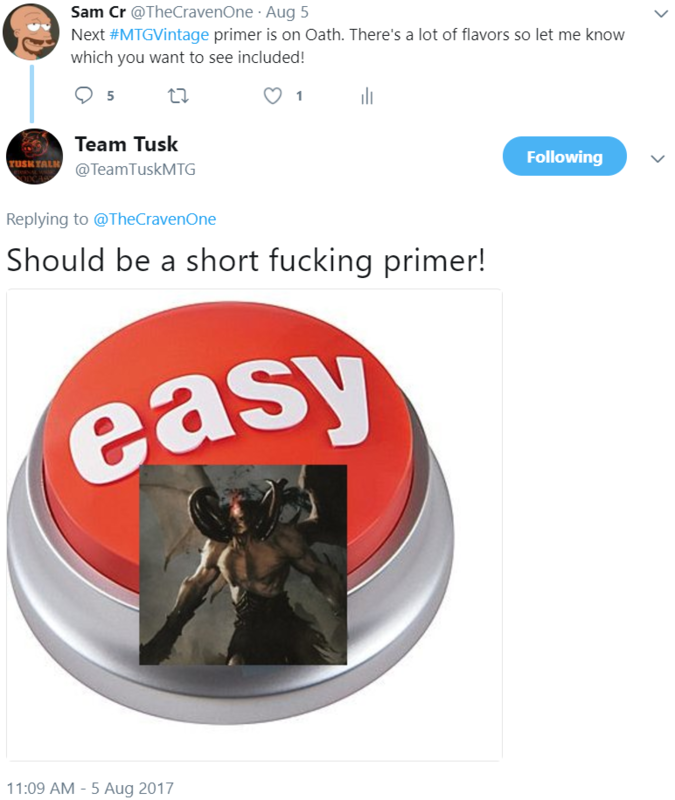 If you've got an Oath on board that your opponent is shutting down with a Graffdigger's Cage, you can "tutor" for an Oath target. Allow Oath to resolve. You'll mill some cards until you hit your target. That card will now go back on top of your library and you will draw it for the turn. Now just pay 2U and baby, you got a stew goin'! In control decks, Will is often used to sculpt the hand, clear up opposing threats, and in general, assure victory over the course of the next few turns. In combo decks, barring an extremely hateful boardstate, even a modest Oath mill combined with Will is likely to result in immediate victory as critical mass is effectively achieved as soon as Will resolves. Sometimes, there are cards that you just don't want in your graveyard. Memory's Journey allows you to return a card to your deck to be later drawn or tutored for. This can allow a single card to be played many times in a single turn when combined with Yawgmoth's Will. Again, some graveyard synergy. Hopefully, Dragon Breath is milled before your Oath target is. If it is, for the low cost of (R), you can give it Haste! I don't really know what to say here. 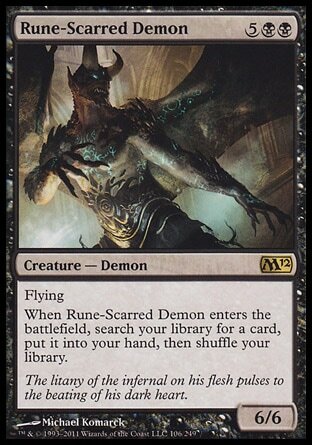 If a flying Yawgmoth's Bargain is good, a flying Demonic Tutor has to be good too, right? When I originally started writing this, I had nearly a dozen lists pasted in line. However, the difference between the Oath deck above and those below is often only a "package" of a few cards. I've decided to instead just post the package. If you'd like a full list for one of these decks, you should be able to find one quite easily. This build is quite similar to the "base" build. However, it adds the combination of Grove of the Burnwillows and Punishing Fire with Life from the Loam to return a destroyed or milled Grove. This combo helps to clean up opposing Mentors and its tokens as well as Workshop's less-costly creatures. Oh, and it kills Containment Priest, too! In a pinch, Grove + Punishing Fire can even act as a slow clock. Sun Titan has long been played in Oath decks as a way to get back powerful permanents milled away by Oath. More recently, Saheeli Rai has joined the mix. Saheeli makes a copy of Sun Titan to bring your on-board power up to 12 and trigger a new return from the Titan. One (or more) of those Titans will then attack, getting you yet another trigger. Finally, Sun Titan is certainly the most easily cast Oath target that will be discussed in this post! The first few decks were essentially Big Blue variants with Oath added. These are essentially storm decks with Oath added. There are three storm variants for Oath. I wanted to start here but unfortunately, this has become so infrequently played that I couldn't find a recent deck. Basically, this deck is exactly as described above; a Perfect Storm deck with Oath for Griselbrand acting as a super-fast, easy to cast Yawgmoth's Bargain. As with Comboath, this deck is basically an existing deck, Burning Tendrils, with Oath added as additional Yawgmoth's Bargains. Paradoxical Oath trades the traditional storm shell for the new Paraodixal Storm shell. This deck was first described to me as, "Tendrils with training wheels," and I must admit that it certainly feels like that. For someone wanting to try Oath but not wanting to start with a more "vanilla" build, I'd recommend starting here. Named for the one-shot kill of the Golden Gun in James Bond video games, this version of the deck looks to kill you immediately upon Oath's trigger resolving. The goal is to Oath into Blightsteel Colossus, attach a Dragon Breath, and immediately swing for lethal. It is quite possible for this deck to win without allowing its opponenet a turn. This build adds the Bomberman combo. 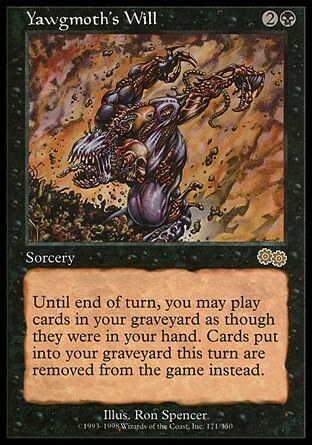 When triggering Oath, you're looking to both put Auriok Salvagers into play and Pyrite Spellbomb into the graveyard. Salvagers is often paired with another Oath target to allow multiple play options. This build may be worse than other modern Bomberman builds as they've begun to adopt Walking Ballista as a much faster kill, which cannot be safely played alongside oath. Oath checks on trigger and on resolution. If you don't have more creatures than them at the start of your upkeep, it won't trigger. They've got a cage, you've got enough mana to cast: mill, duder stays on top, draw and cast duder. "Show and Tell dodges much of the most common Oath hate, including both Grafdigger's Cage and Containment Priest." Show and Tell certainly doesn't dodge Containment Priest if you plan on Showing a dude. My editor is Howard G. "Ward" Cunningham. I'd expect nothing less from an Oath primer. Except maybe, Mox Orchard Oath the End. Following up to our conversation on Twitter, would definitely like some sideboarding strategy advice. I've been trying out both Librarian Oath (shoutout to Ben Perry) and a Burning Paradoxical Oath list that Jason Jaco played.